In our American history class we are researching contemporary issues and designing ways that people can take action and improve our community. Our group is focused on Negative effects of social media. This issue is important because its a huge problem today.This issue is complicated because it is caused by random teenagers online and it is through the web which we don’t have control over. However, we need to address it because it has serious effects like suicide,violence,misunderstandings, and ruined relationshipsn.It also has the long term effect of depression. To address this issue, we think that people should seek help by joining a afterschool program that we designed named Talk About It its a support group where teens feel safe and have people to share their experiences with. Some people might oppose this idea because they think its a waste of money and resources , but it is a good solution because you are surrounded by people who understand what you are going through and can relate to you. They would also feel more comfortable with teens than adults. To raise awareness about The Negative Effects of Social Media. We have made a prototype that is a Visual art piece that shows our AMAZING art work. Please give us any feedback you have about our prototype to help us improve it to help raise awareness about this important issue. Prototype Rising Awareness About The Negative Effects of Social Media by Cesar is licensed under a Creative Commons Attribution-ShareAlike 4.0 International License. I think this is a great idea. A friend of mine started a group like this and it turned out to be a great way for people to openly talk about the difficult things they are experiencing in their lives. It was a safe place which made everyone know they wouldn’t be judged but that they would receive the listening ear they needed. This is such a healthy way to overcome this issue we all face today. I think this is a great start. I would focus on how to get the plans off of the paper and into action to better the community. I also really like your plan of preventing bullying before it happens instead of waiting . This is good! but there are some errors that needs to be revised. but it seems like your solution was used before in some other issue prototype but minor nothing big. Your artwork is cool Powerful and it says a lot in so many words. Your argument is very clear and you have a good thesis to start it off. When reading your work I just wanted to know is it all social media that you are talking about or just a certain one? Not only kids use the internet is a negative way because adults also have a negative effect on social media. With your solution can you talk more about “Support groups” and how having them will help out teens. Thank you for your post and artwork. If joining after school program was your only one solution, then how do you get that program Talk About It available when the government cuts off billions of dollars in summer and after school programs? How do you get your message out, so people would be a part of your program? Awesome! I believe that this solution will have lots of good benefits for all schools and districts. 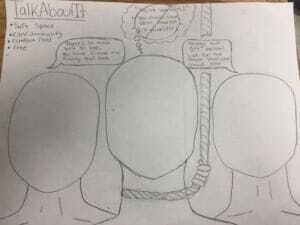 Your image sends a strong message about social media being the reason why teenagers consider suicide as the only alternative. This is truly a fantastic idea. My school has been recently affected by a classmate who committed suicide. The importance for programs like this to help kids suffering from depression or bullying leaves me speechless. The only way to make something like this work however, would be to have a really cool teacher that is very relate-able and easy to trust. I think this is a great start for you. I think this is a topic we all need to talk about and not shy away from. Great idea, and sounds like it could be well executed. Maybe try to talk about preventing that kind of talk on social media before it happens. Raise awareness on the effects your words can have, and will have, on social media. Good start. How could you clarify your plans for the group in the image? Might you need to incorporate more text or more visual details to help viewers understand the problem and solution? Is there only negative effects with teenagers using social media or is it adults as well? why is it a problem today? You have a very good argument. Your thesis is also very clear. Is there certain social media’s where the negative effects happen the most. There is also a few typos but you guys should be fine just proof read it over again. Overall this is a good introduction paragraph to begin with. Thanks for sharing your AMAZING artwork. I would like your image to somehow convey that social media and bullying online is the reason why these people are considering suicide.